FCX | Shell and tube type | Heat exchangers | TAISEI KOGYO Co., Ltd.
A built-in temperature regulation valve in the water chamber makes the FCX ideal in places which require oil temperature regulation and control as well as an oil cooler. The water chamber cover has a built-in oil temperature regulation valve that stops cooling water flow when the oil temperature falls below the set temperature. 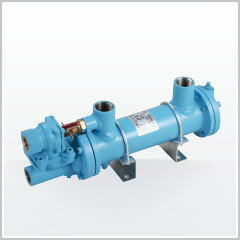 The temperature regulation valve set value regulates from 35-55℃.